Taxes can get much more complicated if you have to report stock trades. 1. Do I Have to Report All My Stock Purchases & Sales if I Lost Money? Unless your investments are in a retirement account, such as a 401(k) or IRA, you'll have to report all of your stock transactions to the Internal Revenue Service every year. If you live in one of the 43 states that assess state income taxes, you'll also have to report your trades to your state. Profitable stock trades will result in taxable gains. If you held your stocks for longer than one year, you'll benefit from the lower capital gains tax rate, rather than your ordinary income tax. Gather 1099s. If you make stock trades during the year, your financial services firm will send you a Form 1099-B at the end of the year with relevant information for your taxes. You'll get one 1099-B from each firm where you placed a trade, so you'll need to wait until you get all of your 1099s before you can correctly file your taxes. Divide trades into short-term and long-term. Since long- and short-term trades are taxed at different rates, you'll need to segregate your trades by your holding period. Short-term trades are those held for one year or less. Collect information that's not on 1099s, if required. Starting in 2010, financial services firms were required to keep cost information for trades and report this information on 1099s. If you've held a stock since before 2009, your firm may not have all the relevant information on your trade, such as your cost basis or date of purchase. You'll need to come up with this information from your own records. Check the appropriate box on form 8949. If your transactions were reported on Form 1099-B, including basis, check box A. If your information comes from Form 1099-B but does not included cost information, check box B. If your trades were not reported on Form 1099-B, you must check box C.
Enter stock information on Form 8949, per IRS instructions. You'll need to provide the name of your stock, your cost, your sales proceeds, and the dates you bought and sold it. Short-term transactions go in Part I, while long-term transactions go in Part II. If you need to adjust your gain or loss, you'll have to provide a code to the IRS informing it of the reason for your adjustment. Transfer information to Schedule D, per IRS instructions. Depending on whether you checked box A, B, or C at the top of Form 8949, you must enter your short-term gain or loss information on line 1, 2, or 3 of Schedule D, respectively. Long-term gains and losses must go on line 8, 9, or 10 of Schedule D, again depending on whether you checked box A, B, or C for your trades. Calculate your gains and losses. Follow the instructions for Schedule D to total your short-term and long-term gains and losses. 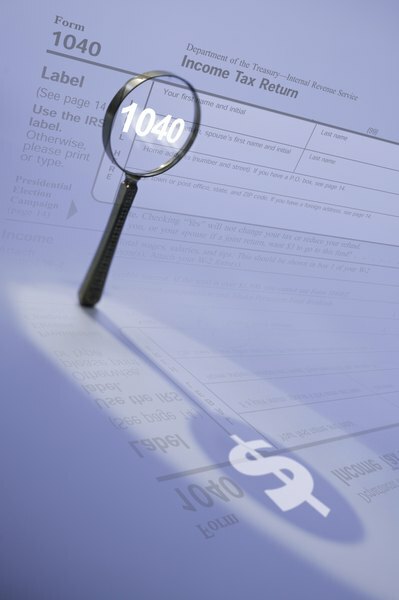 Transfer information to Form 1040, per IRS instructions. For short-term gains on losses, transfer the information to line 13 of your Form 1040. Since long-term gains are taxed at a lower rate, you'll compute your tax using the Schedule D worksheet before transferring the tax amount to line 44 of your form 1040. Copy federal information onto state tax returns, if required. While the details of state tax forms vary, states that levy an income tax typically only require the raw data, such as your adjusted gross income, from your federal return. You won't have to enter all of your individual trade information again on your state tax forms. Can You Use "Various" in the "Date Acquired" Column of Schedule D? Are Capital Gains on American Eagle Coins Taxable? Can You Mark Stock Purchased at Various Times on a Schedule D?